How to Hang, Fold, and Store Clothes the KonMari Way — We KonDo It! By now you have your Keep-It pile of clothes. Maybe made a few trips to your local donation center. Now, you’ve got to put Humpty Dumpty back together again. Here’s how to put your clothes back in the closet and drawers! Long, dark, heavy items on the left. Short, light items on the right. This diagram sounded simple enough, until I got to a black lacy top, then a long, cream-colored sweater. Does the black top go on the left because it’s dark, or the right because it’s short? Does the cream sweater go on the right because it’s light, or the left because it’s long?! Some sort of combination of the two. I tried sorting strictly by color but found it too confusing. When dressing myself I think about warmth first then color. Consider the weight of each piece of clothing as you go. It makes your closet more functional if you separate things this way. You'll naturally divide your wardrobe into things you're more likely to wear in the winter versus summer if you pay attention to an item's overall heft. I organize my clothes mostly by color, but a certain gravity to material. If something feels overwhelmingly heavy (or long) I find a space for it further to the left. Likewise, for my very lightweight items, I keep them on the right. Everything else is roughly sorted by color, but with items of like color hung according to length and weight. All black pieces are on the left, sorted from longest to shortest, and heaviest material to lightest material. The only exceptions are any lightweight black tank tops, which I keep with the rest of the tank tops on the far right. Next is a long, light and dark sweater, which is here because it’s so very long. Blue clothes: sorted somewhat from navy to light blue, but heavier material toward the left. All remaining lighter colored and lighter material clothes, sorted by color. Dresses, which I wear the least. Bras! This is not an approved Marie Kondo method, but I prefer hanging them up rather than having them in drawers. You’ll have to experiment with what works for you. I think Marie’s folding process is difficult to grasp, and one I hear people complain about the most. I know I did. The KonMari method for clothes folding is done by utilizing a large surface area, like the top of your washing machine or bed. 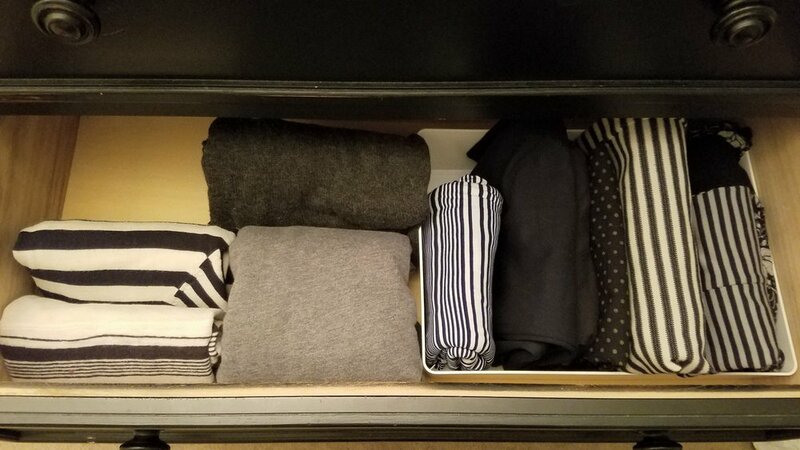 When you fold things the KonMari way, you wind up with a neatly tucked-in, rectangle burrito. Her method for folding clothes is based on the principle of saving space. Which it does. I definitely employ it and I encourage everyone to use it. However, I’ve tweaked the folding process slightly because I don’t like having to find a large space to fold. I want to get it done as soon as possible, and I want to do it wherever I am. I hold my clothes up to my chest or if I’m sitting, on my lap. I also fold things more horizontally rather than vertically. Watch this video to see how I do it. This is the first video I’ve ever done, so apologies for the amateur... everything! Lastly, fold things until they’re Good-Enough, rather than perfect. The rest of my clothes live in the dresser, or the small shelf on the left. My jeans originally lived inside drawers, but I decided I wanted them out. I pretty much wear jeans every single day. I always pick out a pair first, and the rest of my outfit follows. So I thought they deserved a special showcase. I’d thought about doing this for years, of having my jeans out on display just like at the stores, but for some reason, I thought that just wasn’t “proper.” I wish I'd done it sooner. Trust your instincts! This way, I can see them a lot better, and there’s more room inside my dresser for other things like sweaters and tops. Again, for me, it’s about making things functional and conducive to how I am. Tank tops, T-shirts, and long sleeve tops live here. I sort by color, and I separate tanks and tees that have designs on them. Sweaters on the left, skirts in a container on the right. You know your suitcase, which is bigger than your gym bag, which is bigger than your laptop bag, which is bigger than your makeup bag? If you put all the smaller bags inside each other, you only need to make room for that one big bag. Why didn’t I think of this?! Save yourself some space, and pack smaller things inside the bigger stuff (provided they're the same type of item, like bags). It’s never too early to employ this as you go through your things. Not just clothes, but everything. And that is to remove the price tags and stickers. Until you remove those, that thing isn’t quite yours. It’s like a rental. That goes for books, dishes, vases, picture frames, electronics, toiletries. Perishable foods might be the only exception. Everything else that's going to stay in your home needs a thorough scrubbing of all tags and stickers. Tags are pretty obvious, but stickers can be evasive. You know the ones I mean. The "Made in..." stickers. The price tag stickers. The "Made by..." stickers. Grab some soap and a sponge. Scrub until that sticky residue is gone. I hope your closet is coming along. It can take some trial and error to figure out a system that feels good to you. Just keep trying! As you organize your things, think about what’s important to you. Is it space? Is it function? Show off what’s most important. This is your place.